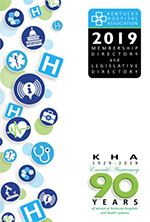 The Kentucky Hospital Association is proud to serve all the hospitals in the commonwealth. We value your support and want to ensure we provide you with a sound investment for your dues. This guide provides a brief introduction to what services the Association provides, and guides you to additional information available on our website and to the right staff members to answer your questions. The Association works for you, so if there's ever anything the KHA staff can do to assist you, please do not hesitate to let us know how we can serve you better.